Click here for the school latest newsletter. The Arab Evangelical School and Home was founded in 1954 by twin sisters Ada and Ida Stoltzfus who were American missionaries. The school aims to provide the highest standard of academic and social schooling to all its students. The school motto is Proverbs 22.6 -t "Train up the child in the path he should go and when he is older he will remain upon it". The Directors and most of the teachers are Christians whilst the majority of the pupils are from Muslim families. The school currently has around 300 students aged between 4 and 12 years. Most of the pupils come from very poor backgrounds and at the school they receive a good education - the key to future employment. The school is popular and has a good reputation in the area although from time to time local conflicts and problems occur. There are Christian assemblies at the school every day as with most UK primary schools. The school has set up a "hearing impaired" unit ,and the Trust has played a major part by providing over £8,000 of equipment and for the last four years paying the salary of one special needs teacher in the unit. Remember the staff and children in your prayers as the new term rolls out. 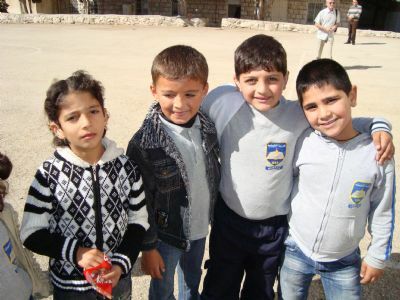 Also,pray for the new extension to the school , in Bethlehem . Fixing the "shoes" before a lesson in the unit for "hearing impaired" children. they can hear and partake in a full school life is awe inspiring. These children represent the future .Could you help us to help them?